Attention Corvette owners. Yes, you can put your fiberglass Corvette body reliably on a rotisserie and get to ever inch without fear of cracking or misalignment. Our Corvette Sub-Frame system, shown in GRAY, is the most rugged system to mount any year of Corvette. There are 6 sections that are approximately 5-1/2 feet long that bolt together using our well known 3/4” structural bolts along with two (2) cross members. It has eight (8) body mounts: Four (4) for the bird cage, two (2) for the radiator core support, and two (2) for the rear body mounts. 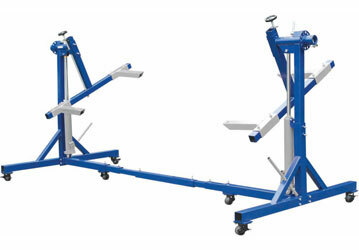 The Corvette Sub-frame securely clamps onto the rotisserie swing arms with bi-directional clamps. This system is designed to achieve less than 1/16“ deflection over 16.5 feet. It just does not get any better than this. Every AutoTwirler has a 1 year warranty on the jacks & casters and a 5 year warranty on steel components against manufacturing defects from the date of purchase. This warranty does not cover mis-use, not following instructions, or items that have been altered in any way. Replacement items are available, at a cost, if needed. This warranty is not transferable and must have proof of purchase. If you purchased your unit thru a dealer, mail order, or other provider, we highly recommend that you register your product with us by mailing, or faxing, your receipt or calling us with your name, address, phone and date of purchase. If you purchased your unit directly from us, your information should already be in our customer database. This will fit our AutoTwirler PLUS (shown in green) or our AutoTwirler PRO, neither are included. Six (6) side members, two (2) cross members, eight (8) mounting posts. Fits all years of Corvettes.